Dylan O' Brien, Michael Keaton, Sanaa Lathan, Taylor Kitsch, David Suchet. Vince Flynn is a popular writer, novels of espionage and undercover agents – even beyond Jack Reacher at times. While this novel comes late in the series, it does provide a background story of the young agent, Mitch Rapp, and the reasons for his involvement with the CIA. This is very much a CIA story. The film is not to be mistaken for the similarly titled American Made, with Tom Cruise as the rather happy-go-lucky rug-here. There is nothing happy-go-lucky about Mitch Rapp at all – at all. There are some moments right at the beginning, a happy Mitch and his girlfriend at the beach, his proposal and her delighted response, his going to get a drink for them both and a sudden invasion of terrorists, machine-gunning, a massacre. It is no wonder that Mitch devotes all his energies to revenge. While the book was written in 2010, the screenplay gives more attention to Islamist jihadists and the CIA infiltrating their cells, even to Libya. CIA chief, Irene Kennedy (Sanaa Lathan) has great faith in Mitch, wanting to capitalise on his single-mindedness, sending him to the expert trainer, Hurley (Michael Keaton in a very tough role). We get a glimpse of intense physical and psychological training, including virtual reality tests. However, the main focus of this particular story is a rogue student of Hurley’s, Ronnie, nicknamed Ghost (Taylor Kitsch moving from hero roles to villain). Capitalising on all the tough skills that he learned from the expert, he becomes involved in smuggling and trading, especially plutonium from the former Soviet Union, with agents of such countries as Iran wanting the plutonium, wanting a bomb. It is up to Hurley and Mitch to thwart the bomb plans. Actually, the action does move from country to country, making it enjoyable for people who have visited these places: Warsaw, Istanbul, Romania, Rome, Dubai. The Rome scenes are particularly vivid, an underground venue for assembling the bomb and shootouts, and a threat as well as exact timing for a detonation with a serious American target. 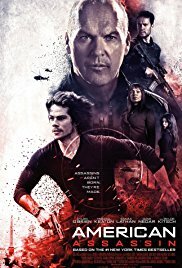 Dylan O’ Brien could continue this franchise (after appearing in the Maze Runner series), ultra-serious, unrelenting and deadly (even in the tongue-in-cheek final moments of the film). And there is David Suchet turning up at times as a CIA consultant. In 2017 this could be Kim Jung Un’s favourite film, nuclear weapons, attacks on the US and its interests – and the potential of how easy it is for a single individual to have a bomb and detonate it rather than lots of test flights! 1. A topical action thriller? Terrorists? Jihadists and massacres? Revenge? 2. The US perspective, the role of the CIA in contemporary politics and terrorism? CIA training, assassins, undercover agents? The nuclear realities? The post-Soviet era and plutonium? Career terrorists? The bomb, the visualising of the consequences of an explosion? 3. The introduction to Mitch and his fiancee, happy, the proposal, the beach, getting the drink, the arrival of the terrorists, the panic and people running, Mitch trying to help his girlfriend, her being shot? 5. Irene Kennedy, the role of the CIA, her position? The meetings in London with Commissioner Stanfield? Intelligence, information about bombs, smuggling of plutonium? The visuals of Poland and the plutonium, the exchange, the agents, the shootout? Ghost and his stealing? 6. Mitch, interviews with Irene, her belief in him? His skills, motivations? Intensity of character? Being sent to train with Hurley? Michael Keaton as Hurley, tough, the details of the training, harsh, physical combat, not making it personal? The experience of the virtual attacks and tests? The issue of Mitch and not obeying orders? 7. The scene in Istanbul, the pursuit, the mission, the contacts, escape? 8. The Iranians, those for the treaty with the US, those against? The politicians, the military? Deals? The nuclear plans? Against Israel? 9. In Rome, the character of Ghost, seeing him in Poland, seeing the navy photo, his being Hurley’s star student? The underground centre, the assembling of the bomb, the various representatives, the demonstrations, the need for getting a scientist? The shootings? 10. The scientist, his being identified, the group following him to the hotel, the girl, her being an agent, with Mitch? The camera, watching the scientist? Hurley waiting? The terrorists, the shooting, Mitch and his suspicions of the girl, the interrogation, the potential drowning in the bath? 11. Hurley, the attack, his being taken? Mitch and the girl escaping? In the car, together, finding the underground? Hurley, the discussions with Ronnie, his being tortured, the fingernails, the electrodes? Ronnie attacking him for creating monsters? Hurley and is suffering, defines? 12. The explosions, the confrontation with the kill and her dying, Mitch driving the car, freeing Hurley? Pursuing Ghost, onto the boat, the bomb? 13. Irene, the associates, watching the screens? The fleet and exercises as the target? The messages, the commanders of the fleet? The visualising of the boats in the water? The time? 14. Mitch on the boat, the fight with Ronnie, stabbing him as advised by Hurley? From the bomb into the sea? The helicopter, the rescue of Mitch? 15. The undersea explosion? The waves, huge, radiation, the buffeting, the destruction of the ships? Yet the saving of lives because of the explosion under the sea? 16. Mitch, in Dubai, relaxing? The information about the Iranians, the general and his plans? And the irony of the closing scene with Mitch in the elevator with him?